Last winter my chiltepin plants had a bit of a rough time - they all froze and only half of them came back in the spring. 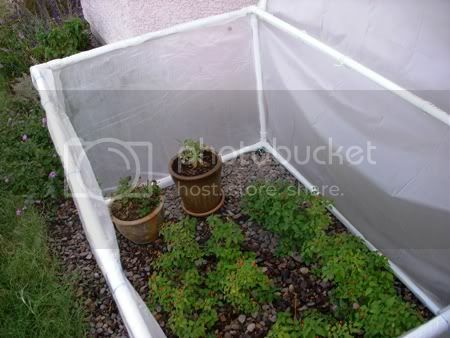 So this winter we thought we'd make them a mini greenhouse to help keep them from freezing again. It's made out of PVC pipes and old shower curtain liners, which are attached to the pipes with 2 inch lengths of vinyl tubing which have been split down one side*. It has a hinged lid so we can get inside it and so we can leave it open during warm times. 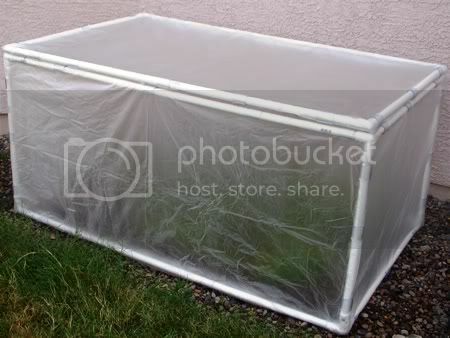 And since the shower curtain liners are translucent we can leave it shut if we go on vacation and the plants should still get enough light to survive (Christmas vacation is what did them in last year). Hopefully this will help my chiltepins make it through the winter! * Update 12/4/09: The vinyl tubing does NOT work! Not in Arizona at least. Either the temperature change during the day or the strong wind pops the vinyl tubing off of the PVC pipes. For now we have replaced the vinyl tubing with duct tape (lots of it!) and we are looking into a product called Snap Clamps, which are made for holding plastic/fabric on to PVC pipes.